We’re pleased to announce that Dr Julia Jones is this year’s recipient of the inaugural MPavilion / Art Monthly Australia Writing Award. Receiving $3,000 to develop her submission, Dr Jones will write an essay to be published in the October 2015 issue of Art Monthly Australia. 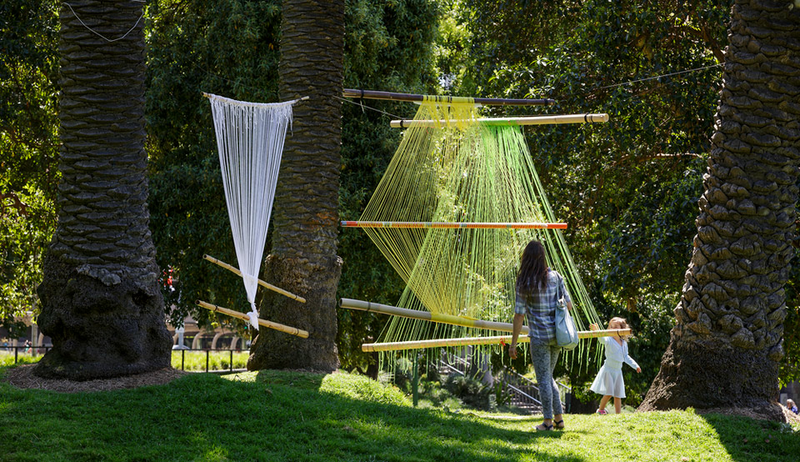 She’ll also present her piece in person, as part of the MTalks program in MPavilion’s 2015 season. Julia Jones completed a cross-disciplinary PhD in international ecological cultural theories relating to Australian art and literature at the University of Newcastle, NSW in 2006. Her research interest in the intersection between art, design and gardening practices extends as far back as her experience as a research assistant for the 1997 Australian Perspecta exhibition Between Art and Nature. This year MPavilion and Art Monthly Australia have also supported a Highly Commended Award to emerging art and design researcher and writer Alison Groves. Alison has completed a Master of Arts Administration at UNSW Art & Design, where she is now a research assistant and tutor. Combining her three research interests—Japan, curatorial methodologies and ageing—she is currently working with the Australian representatives at the Echigo Tsumari Art Triennial in rural Japan. For the inaugural award, Australian writers were invited to submit a proposal of no more than 200 words—for an essay of no more than 2,000 words—exploring one or more aspects of the relationship between art and design today.